These are our LOWEST rates & not negotiable. Per Day: 24 hrs. from “check-in time mentioned while booking”, irrespective of “actual check-in time”. a) Complimentary Breakfast (for individual rooms only). 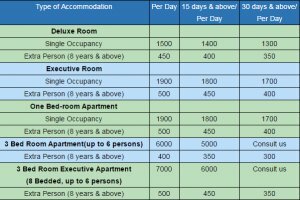 If you book ‘complete apartment’ the Breakfast is chargeable @ Rs. 75/- per head (b) Electricity (c) Water (d) Internet Wi-Fi (e) Daily House-keeping (f) Maintenance (g) Car Parking (subject to availability) (h)One full-time helper.